Aside from maintaining an unsullied integrity in the sport, and doing away with the usual set up of an organization with Old Boys’ Club mentality, the WBO is finely carving a name for itself as an organization with a heart, operating in an environment where as it grows bigger, it knows its accrued social responsibility is just about as huge. Nothing illustrates that more than tomorrow’s big event, where again the WBO is at the center of a ring battle that has the potential for a classic featuring world champion Donnie Nietes against world champion Moises Fuentes. ALA Promotions, the country’s biggest and most respected boxing outfit, is putting up this mega event as part of its “Pinoy Pride” series in partnership with ABS-CBN, and it seems this show will be another blockbuster. But behind all the hoopla, the WBO’s Leon Panoncillo is also busy preparing for an event that truly makes this occasion extra special. Tomorrow morning, the WBO Kontra Drugs once again takes place here in Cebu, where a baseball event will be sponsored by the sanctioning body for the poor kids in the city. Michael Angel Lopez, an award-winning baseball personality from Cebu, has been tapped by the WBO to put up the baseball event. “I see there is so much poverty going around in my country. I see kids sleeping on the streets begging, and I know something must be done,” said Panoncillo yesterday after the official press conference of the Nietes-Fuentes fight. 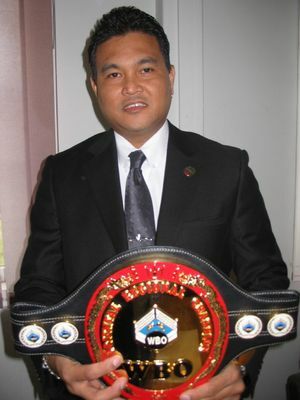 “So this is where the WBO would like to somehow have a part. That as we grow bigger, that we care better,” added Panoncillo, who is expected to grace the opening of the WBO Kontra Drugs event along with Cebu City Mayor Michael Rama, WBO officials, and boxing legend Marco Antonio Barrera. The WBO’s recent entry in Japan, which was formalized last week with no less than WBO president Paco Valcarcel and Panoncillo along with ratings chairman Luis Perez visiting Tokyo to meet with officials from the Japan Boxing Commission (JBC) and Japanese promoters, as well as the upcoming WBO double world championship in Macao, has just solidified the WBO’s position as the number one boxing body in the world today. Panoncillo, however, sees it as a chance to not just oversee boxing, but also to give the sport a heart for the less fortunate. “The annual WBO Kontra Drugs is not just a program we do in Asia every year, but this has been on going in other parts of the world, courtesy of the WBO. And we plan to do this for as long as we can,” said Panoncillo.